Last week, I read this article at WebWereld (a Dutch IT news portal). It says that Microsoft is chasing sellers of illegal copies of their software at auction and online market sites. Nothing new here, however, Microsoft also wants auction and online market sites to be responsible for the items they are selling. I don’t think I agree with that bold statement. Ofcourse, a lot of illegal copies of software, clothing, DVDs, games and watches are being offered on those sites. The most famous market site in The Netherlands for example, is www.marktplaats.nl, and if you do a search for Omega, Rolex, Panerai, Breitling, Cartier or any other famous brand, you will be amazed by the amount of watches being offered. A lot of them are one-time offers by private sellers, but there is also a big amount that is being offered by wholesale ‘companies’. I doubt if they have any form of administration :-). Can you make, in this example, Marktplaats.nl responsible? I think not. Like eBay (Marktplaats.nl is part of the eBay company), there is a link at every item-page that can be clicked if an item is not allowed. You can’t expect such sites to check every item that is being offered. Making it possible to warn them about such fraud, is the best and maybe only thing they can do about it. As for possible buyers… the golden rule is that if an offer seems to good to be true, it probably is.. Omega Seamaster Planet Ocean models for 119 Euro? Sure. Besides that, it will be more difficult to attract people who have original/authentic items to offer. You don’t want your expensive watch for sale with all those fakes, right? It doesn’t make sense, because the target audience is probably looking for fakes only. At least most of them are. 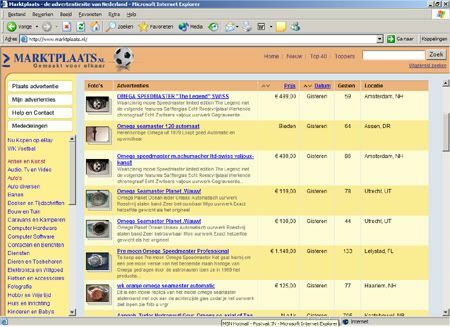 Take your business to professional watch market sites like www.chrono24.com¬or have it sold in consignation.